This past week, we kept with the jig theme and talked about the use of the Em chord in a G tune. In our case we tried it in the B part of Mulhaire’s Jig. This is a fairly common pattern in Irish G tunes where the A part is very clearly major and the B part can have a more minor flavor to it. Here’s an example of another tune you can try it with. The second half of class was devoted to minor progressions which we played out of the A position (just to change things up again). 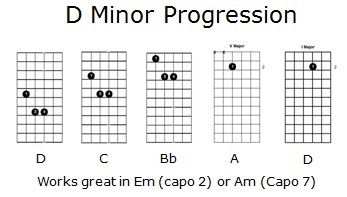 So place the capo at the 7th fret. Here are the finger positionings for review. As an example, we learned a well known jig, “Lilting Banshee”. It is sometimes known as Killaloe Boat. It is a two-part jig in Am. (Note: Thanks to BRIMS and Tes for this recording… much better than my mandolin version).